Add the tea and sugar to the water and bring to a boil. Once boiling, take off the heat and let steep for a few minutes. The longer it steeps, the more astringent the final liquid will be. Remove the leaves or bags, and allow the tea to cool. When it is at room temperature, transfer the tea to a bowl (ideally wider than it is deep, and made out of a non-reactive substance - best is good quality glass). Add the mature kombucha liquid, and the scoby. The scoby may float or sink, either is normal. Cover the bowl with a cloth or teatowel, and secure with an elastic band or some string. Let ferment in a quiet place away from direct sunlight for from 7 to 21 days. Factors that make for quicker fermentation include – adding more liquid and scoby material, adding very mature (acidic) liquid, using fresh material, using white or invert sugar, and high ambienttemperatures. Once a mat can be seen on the surface, you may dip a teaspoon onto the mat, pushing it down slightly to taste the liquid. If it is too sweet for your taste, leave it fermenting a little longer. Second fermentation involves placing the mature liquid in an airtight vessel, which allows for carbonation. Any combination of fruit, juice, herbs, teas, roots, etc may be added in small measure, and these will flavour the liquid, and enhance their health benefits. The sweeter the addition, the higher the potential final alcohol content, so a standard kombucha at 0.5% alcohol may reach as high as 2.5 – 3% with a high sugar addition, and long secondary fermentation periods. Kombucha has been around a long time. Our best guess is that it originated in the Manchurian region of northeast China, where by the time of the Tsin Dynasty (around 220 B.C.E.) this ‘immortal health elixir’ was revered for its healing, detoxifying, and energizing properties. In fact, a long and varied traditional belief in the health benefits of kombucha tea is our legacy from ancient times, and this belief remains undiminished to this day, despite some controversy and disagreement. More on that later, but first, what is this sparkling beverage brewed using what many Russian folk call the ‘tea beast’? The tea beast itself is a zoogleal mat, a type of biofilm similar to a pellicle, similar in structure and function to the vinegar pellicle or mother. The kombucha pellicle is an example of a scoby, that acronym we have encountered before – symbiotic community of bacteria and yeasts. What the scoby most definitely is not is a fungus or mushroom, despite ‘tea fungus’ and ‘tea mushroom’ being two more of its many alternate names. As part of the fermentation process, several species in the genera Acetobacter and Gluconobacter are capable of forming the cellulose-based mat which harbours the bulk of the microbial community since most fermentation happens at the air/liquid interface, which is where the scoby sits. Initially appearing as a fine film, the scoby thickens with time, and then with each further fermentation. With each fermentation, the scoby or mother ‘calves’, and the old and new scobys may be separated and used individually with an inoculant of mature kombucha liquid to initiate two ferments rather than one. These scoby calves may easily be shared with friends and family, and so the human and microbial communities become even more interconnected, both flourishing, and again we see that symbiosis is more than just a theoretical notion. This is what empowerment in nutrition and health is all about – the human community freely sharing those things that replenish body and soul. As well as cellulose, a typical scoby may be expected to contain about 20% crude protein, 10% crude fibre, 7% calcium, and 5% phosphorous. 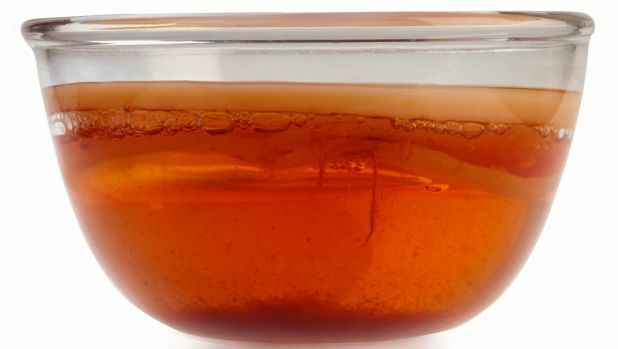 The ability of the scoby to absorb metals and other potential pollutants or toxins from a liquid substrate has been well demonstrated, and while this effect is more pronounced with dried material, a living scoby will accumulate such things as arsenic, chromium and copper. Within the solution itself, chromium, lead and fluoride have been identified where these exist within the substrate (including water) or fermenting equipment. The functional (bioavailable) levels of the essential minerals manganese, iron, copper, nickel and zinc are increased within the kombucha liquid, but levels of cobalt are reduced. Reduced cobalt is most likely the result of vitamin B12 metabolism during fermentation, but it should be noted the B vitamin content of kombucha is variable, and often negligible. The ability of the scoby to absorb potentially damaging levels of toxic substances is of importance if we consider utilizing excess scoby material as a human or animal feed supplement. Measures we can take to ensure our drink and scoby contain no contaminants include: ensuring we don’t ferment in ceramics containing lead based glazes; not fermenting in reactive materials such as stainless steel or plastic; using organic or otherwise chemical free ingredients, and; ensuring our water is pure. Other uses for scoby material include use as water purifier, as a ‘fabric’, as a ‘canvas’, and as a wound dressing. Kombucha, kombucha tea, tea kvass, or KT are all common names for the health giving drink made by the fermentation of sweet tea by the kombucha scoby or mother. We will now have a look at why it is so good for us, and the first thing we discover is that it hasn’t taken us long at all to arrive at our first point of controversy. And it’s no small matter either. Does kombucha tea contain any probiotic lactic acid bacteria (LAB) species? The first thing we must consider is that there can never be a definitive list of species present in kombucha, because as with all other scoby-based ferments, the provenance, usage history, and ambient environment all contribute species to the mix. The second thing we must consider is the difference in identification techniques between studies. Often the correct strategies for identification of lactic acid bacteria have not been employed in studies, and where these have recently been employed, our picture of what kombucha is has changed (or been corroborated). In the most recent assay of microbial diversity of kombucha I have seen (2014), the lactic acid bacteria component (predominantly from the genus Lactobacillus) ranged from minimal to as high as 30% total bacterial diversity in one sample. This study used specific media not normally employed in studies of kombucha microbial diversity, which may go part way to explaining why many studies have underreported or missed the LAB species. Improved sampling techniques and taxonomical (species classification) changes are also informing our understanding of the acetic acid bacteria and yeast components of kombucha. Vinegar-forming bacteria are by far the most abundant species in kombucha. Species from the genus Acetobacter have historically been considered the most important, but nowadays we think those from the genus Gluconacetobacter dominate the community. This seemingly big change however simply results from a taxonomic revision, with the dominant cellulose producing species we once called Acetobacter xylinum now known as Gluconacetobacter xylinus. While new species are continuously being isolated from kombucha samples (including the nitrogen-fixing Acetobacter nitrogenifigens sp. nov., and the nitrogen-fixing and cellulose producing Gluconacetobacter kombuchae sp. nov.), the fundamental gluconic/acetic acid bacterial percentages of total microbial makeup seem pretty standard at over 85% Gluconacetobacter, and around 2% Acetobacter and Gluconobacter. Kombucha is a probiotic beverage, with all the benefits that entails, including B vitamins (variable between cultures), beneficial probiotic organisms and metabolites, and anti-oxidants. Specifically, it is high in enzymes and compounds utilised by the body for detoxification, most specifically glucaric acid. Research indicates glucaric acid and its metabolites have an anti-cancer action, and this is in accord with much anecdotal evidence. Most famously, Alexander Solzhenitsyn credited tea kvass with curing his stomach cancer during his time in the Gulags, and Ronald Reagan heeded this testimonial and used Kombucha to halt the spread of his own cancer. Glucuronic acid and glucosamine have never been isolated from a kombucha sample. Elevated levels of these in test subjects will most likely be the result of compounds formed under fermentation that are used as precursors by the body to manufacture glucuronic acid and glucosamine. Glucosamine increases synovial hyaluronic acid production, which benefits arthritic conditions, and joints generally. The general detoxifying effect of Kombucha is the result of the precursors to glucuronic acid which increase liver production of this important bodily cleanser. The resultant increase in detoxification potential is beneficial to the whole body, and reduces stress to the liver, kidneys and pancreas. Bauer-Petrovska B, Petrushevska-Tozi L (2000) Mineral and water-soluble vitamin contents in the kombucha drink. International Journal of Food Science and Technology. 35:201–5. Bhattacharya S, Gachhui R, Sil PC (2013) Effect of kombucha, a fermented black tea in attenuating oxidative stress mediated tissue damage in alloxan induced diabetic rats. Food and Chemical Toxicology 60:328-340. Jayabalan R, Malbaša RV, Lončar ES, Vitas JS, Sathishkumar M (2014) A review on kombucha tea – microbiology, composition, fermentation, beneficial effects, toxicity, and tea fungus. Comprehensive Reviews in Food Science and Food Safety. 13:538-550. Lončar ES, Malbaša RV, Kolarov LjA (2001) Metabolic activity of tea fungus on molasses as a source of carbon. Acta Period Technol 32:21–6. Marsh AJ, O’Sullivan O, Hill C, Ross RP, Cotter PD (2014) Sequence-based analysis of the bacterial and fungal compositions of multiple kombucha (tea fungus) samples. Food Microbiology 38:171-178. Sreeramulu G, Zhu Y, Knol W (2000) Kombucha fermentation and its antimicrobial activity. Journal of Agriculture and Food Chemistry. 48:2589-2594. Srihari T, Karthikesan K, Ashokkumar N, Satyanarayana U (2013) Antihyperglycaemic efficacy of kombucha in streptozotocin-induced rats. Journal of Functional Foods. 5(4):1794-1802. Walaszek, K (1990) Potential use of D-glucaric acid derivatives in cancer prevention. Cancer Letters 54(1):1-8.